To tweet, or not to tweet…your kid’s homework? The discussion continues over social media in curriculums nation wide, and it’s not getting resolved quickly enough. Since the launch of Facebook in 2004, schools have spent enormous efforts to keep students off of devices and away from social networking sites during school hours. Over the past decade, social has impacted our personal, professional and psychological spaces, and now the school system. How do we train teachers? Should there be a national standard? Where do we start? How can we monitor/manage/protect the social learning environment? Should there be one separate class, or fully integrate social into all classroom operations? What about devices? Phones, laptops or tablets…BYOD or will schools provide them? Who will develop the curriculum and how easily can it be updated to accommodate the fast pace of social media? There are definitely more questions, feel free to add yours in the comments below! While school districts are tackling the gnarly details, here are 7 teachers and their advice on how to harness social media in their classrooms. Karen Lirenman – Tweet as a class! In her classroom, students tweet nuggets of information that they’ve learnedthroughout the day. Parents enjoy the peek into the classroom. Kevin Jarrett – Start and maintain a classroom blog! Mr. Jarrett writes reflections about his Elementary STEM lab for parents to read each week. Joli Barker – Connect to other classrooms through social media. Ms. Barker is fearlessly connecting her classroom through a variety of media. Jamie Ewing – Use Facebook to get and give science fair feedback. He shared his process in a recent article. Much easier than dragging a 3-panel poster board around school. Don Wettrick – Use YouTube for your students to host a show or a podcast. Mr. Wettrick’s students hosted the Focus Show online and now share their work on a podcast. Karen Stadler – Further a cause or support a charity. Stadler’s classes are working to save the rhinos in South Africa, and Angela Maiers has thousands of kids choosing to matter. We like the idea of supporting a cause! Another suggestion.. Communicate with other classrooms. The Global Read Aloud, Global Classroom Project and Physics of the Future are three examples of how teachers use social media to connect their students as they collaborate and communicate. Social media boasts endless opportunities and our youth deserves to have they tools they need. Many years ago, we spent endless hours slaving over homework to prepare us for the real world. In 2014, social media is dominating and we don’t have time to drag our feet. 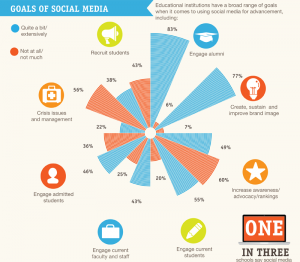 Do you see teachers using social media in the classroom? How would you like to see social integrated into classrooms? We want to hear from you, chime in below!